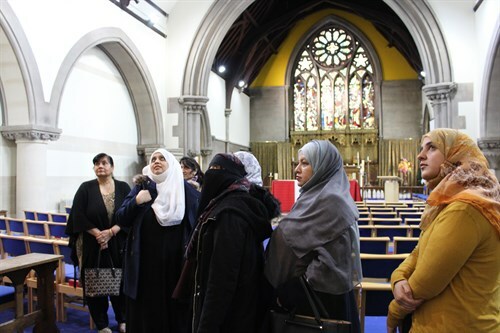 Near Neighbours Black Country organised a free women-only tour of faith buildings in Sandwell for the Women First Group. The aim of the tour was for people from the community to discover new parts of their neighbourhood as well as get to know their neighbours. The Women First Group has been running for a few years, ever since it started as a Near Neighbours-supported project. Members of the group are women in Smethwick from different faith backgrounds who wanted to run a group where women from different faith and ethnic backgrounds can come together for friendship and fun. 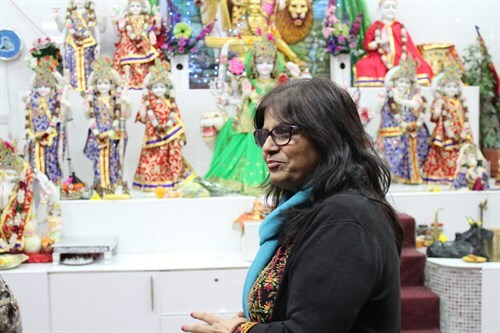 The group has provided a much needed opportunity for women of different faiths to spend time together and gives people the opportunity for the participants to share their knowledge of their own faith. A few of the women took part in the Near Neighbours faith guiding course which trains people to be tour guides in their own faith building, and so most of the tours on this day were led by, or had input from women who belong to the group. The group had women from Muslim, Hindu, Sikh, Christian, Jewish and no faith backgrounds. We met at Holy Trinity Church in Smethwick in the morning, and were taken on a tour by Jenny. The church is a listed building and has impressive stained-glass windows. It has been around since the early 19th century, undergoing several structural changes over the years. Next, we hopped into the mini-van and drove to West Bromwich, where we were greeted by Saeed Nasser at the Yemeni Community Association (YCA) Mosque. This building was much newer than the church, but the atmosphere was just as welcoming. The mosque is part of the YCA, a community centre that offers a variety of services, including the mosque. It was built with the generous support of its members. Saeed was kind enough to demonstrate a call to prayer for us. After the mosque, we drove over to Rowley Regis where we visited the Shri Pashupatinath Hindu Temple. Before entering, we were asked to remove our shoes (as in the mosque) and wash our hands. Once inside, there was chanting music and a large shrine with many different deities represented. Shoba gave us the tour and explained customs, traditions, and the stories of the gods. Each centre wanted to offer us tea or food, but unfortunately, we only had time for one lunch! The women of the temple treated us to delicious vegetarian food including chana masala, aloo gobi, rice, pudding, and more. What a treat! When lunch was over, we made our way back to Smethwick for our final stop of the tour – the Sikh Gurdwara Akal Bunga Sahib. Our shoes came off again here and we also covered our heads with scarves. Kamal and Sucha graciously greeted the group and showed us around the gurdwara. The building is a former church, and the gurdwara did its best to preserve its character, such as the stained-glass windows. After the tour, we were offered chai and Punjabi sweets, which was a lovely way to end the day. The Women First Interfaith Tour was a wonderful way to celebrate Interfaith Week, as well as a highly educational and enjoyable experience. The members of the group were very inquisitive and asked lots of questions throughout the tour. It was interesting to learn about each faith’s customs and beliefs, and see that despite each being unique, they actually have quite a lot in common.